Ah, to be a Seahorse. Those born under this Celtic Zodiac Sign are human computers when it comes to memory and financial or legal resourcefulness. In Celtic tradition the sea is a powerful source of energy, filled with strength. Nonetheless Seahorse traverses those waves elegantly despite such a small stature. 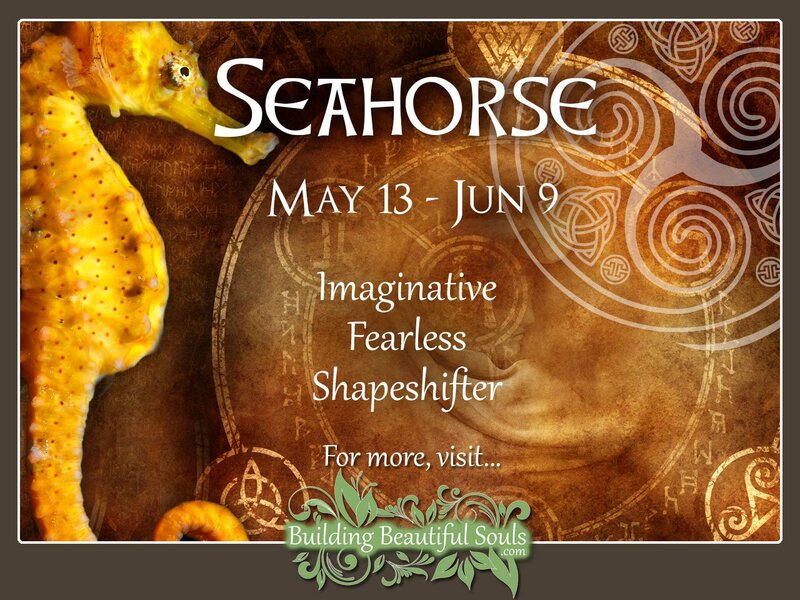 Seahorse people are lucky, creative and imaginative. They love a good adventure and rarely show any fear. Whenever you are travelling by sea, bring someone you know born under this sign for safety. In ancient times people found the appearance of the Seahorse odd and likened this creature to a type of dragon, albeit on a paired-back scale. That ancient power flows through Seahorse people’s veins and they can learn to tap it with time and practice. In particular, those born under the Celtic sign of the Seahorse are shapeshifters. This can be in the magical sense or it may also pertain to the Seahorse’s uncanny ability to adapt in nearly any situation. If this is your Zodiac sign you are probably drawn to living water (water that moves). This is an area where you can re-charge, meditate, and center. Anytime you feel off your personal mark, seek out water as an ally in honing personal truths. Men born under the Seahorse make excellent fathers. In nature, the male Seahorse is the one who becomes pregnant! Once born, this Father is vigilant about their young and grows into a strong family leader. Consider too that when water gets bumpy Seahorse uses their strong tail to stay where they are. There is no way this father figure is going to go under without a fight. Stories of the Seahorse indicate a belief that their Sacred Duty was carrying sailors’ souls safely into the underworld. The Seahorse would not leave the soul’s side until it found their final resting place. With this in mind, the Sign of the Seahorse may have the ability to commune with the dead as well as other spirits. The manner of doing this is highly personal but a scrying bowl filled with water is one good example that knits with this personality type. Female Seahorses are calm and gentle. Your middle name is patience and you find contentment and friends nearly everywhere you swim. Seahorse is generous, and others will be attracted to you for that kind spirit. Just remember to keep your psychic senses tuned in as some people will try to take advantage of your sharing so readily. Overall, Seahorse is a home body. They’re not big on travel or moving from job to job. Rather they want to find a spot where they’re happy and stay there. This also means that Seahorse resists change. Once they’ve found a comfort zone good luck in getting them to jump out of that box. That can be problematic for Seahorse as it deters progress, particularly in achieving a goal that requires uncustomary measures. A very attention-grabbing fact about Seahorse is that it has independent eyes. Seahorse people depend heavily on their sense of vision, including gut instincts. When you need perspective, Seahorse is your go-to person. They rarely turn down any reasonable request, being naturally charitable. Seahorse likes to help, and in fact probably NEEDS to help others to fulfill their life’s destiny. Propriety thy name is Seahorse. This person makes miss-manners look sloppy. You always know the best thing to do in nearly any situation and anticipate other’s needs. There is nothing that people can truly hide from Seahorse, which may put some folks on the defensive. Once they understand that you don’t use knowledge for harm, relationships become more comfortable. Be aware that those born under the Seahorse have strong emotions. Romance, passion, love – they feel each sentiment deeply. This is why Seahorse must ground out from time to time. For while you are “in love with love” that can also become very painful when not reciprocated. This means stepping back and breathing. Communicate your needs to friends and partners so they don’t take your privacy as a slight. Over time they will come to see that like a gentle wave, when you move out you always return to shore.